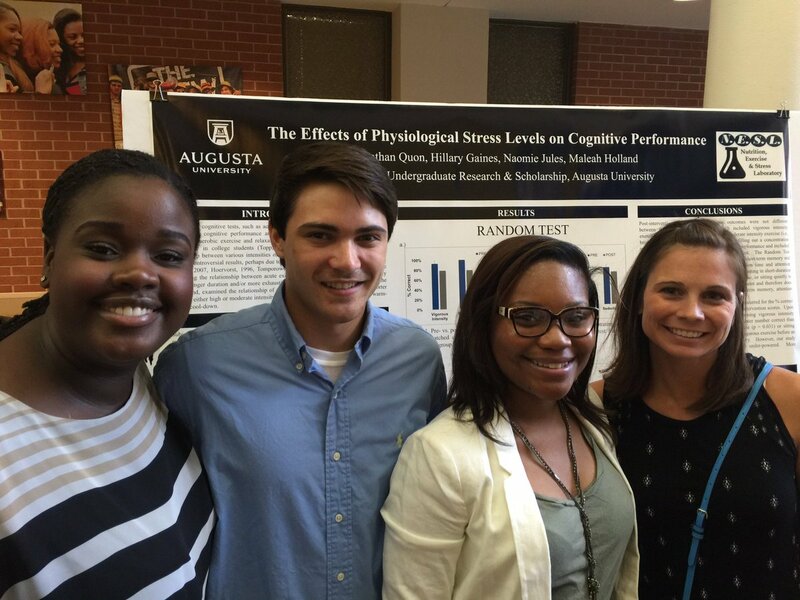 AUGUSTA, GA. – Students from the Augusta University College of Education recently presented research at the 4th annual Center for Undergraduate Research & Scholarship Summer Scholars Symposium on July 21. 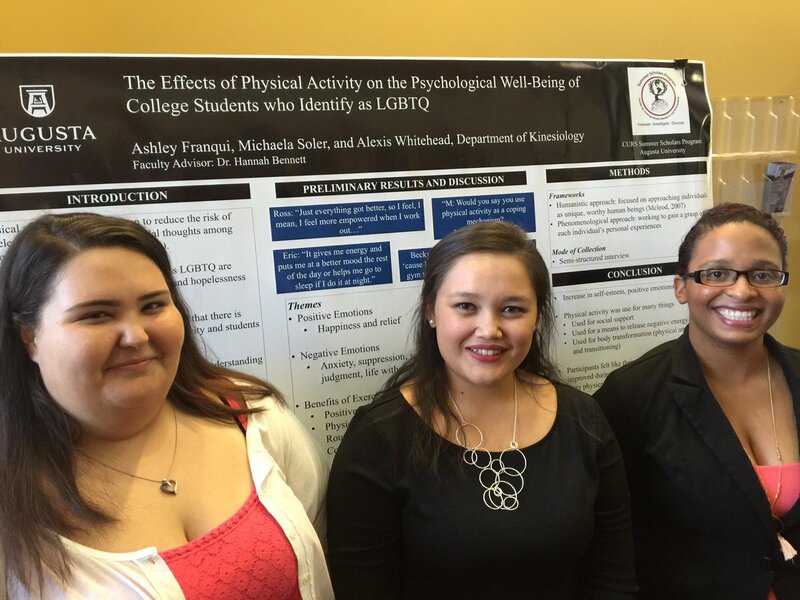 Dr. Maleah Holland (far right) lead students Naomie Jules (from left), Jonathan Quon, and Hillary Gaines in investigating The Effects of Psychological Stress Levels on Cognitive Performance. 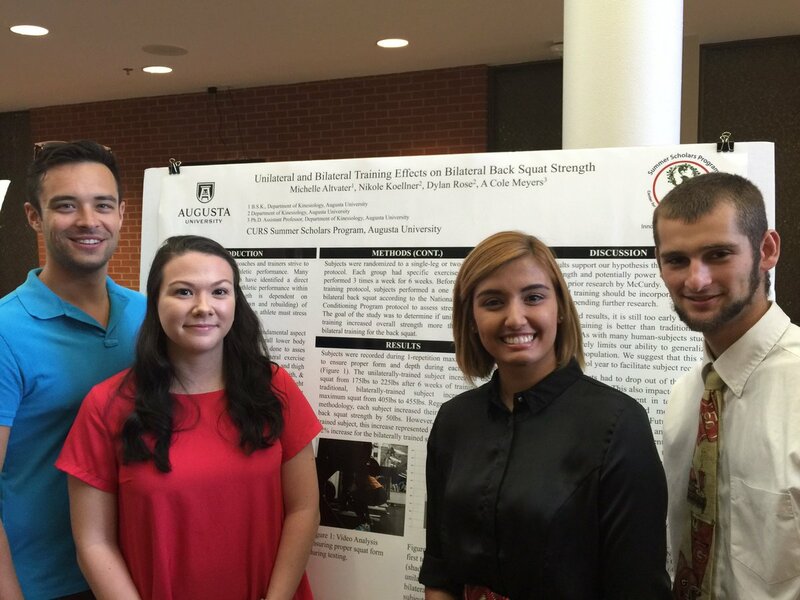 The 2016 CURS Summer Scholars Program hosted 16 total projects, with the highest representation of them coming from the Department of Kinesiology with four research projects and 12 students. “As Augusta University works to become the institution of choice for students who want to perform cutting-edge research, the Center for Undergraduate Research & Scholarship provides an avenue to develop programs to engage students in faculty-led research and creative work,” said Melissa Knapp, CURS Coordinator. Dr. Steven Page, Chair of the Department of Kinesiology, said that his department has made it a priority to actively engage students outside the traditional classroom. 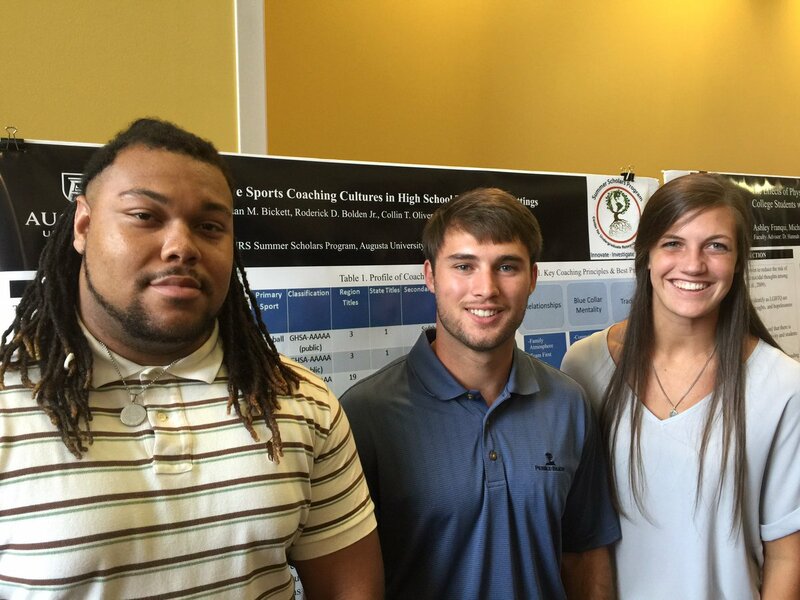 Dr. Graeme Connolly (not pictured) lead students Roderick Bolden Jr. (from left), Jordan Bickett and Collin Oliver in investigating Effective Sports Coaching Cultures in High School Team Sport Settings. “Our faculty are active researchers with an affinity for training new scholars. And we know from studies that students who participate in undergraduate research have higher grades, better graduation rates, and build stronger relationships with faculty,” Page said. It also pays off for students beyond their undergraduate studies by increasing students’ chances to go to graduate school and boost career prospects. Dr. Maleah Holland, Professor of Kinesiology, said that undergraduate degrees are usually based around learning and memorizing information, but that understanding the process behind the findings written in textbooks adds another dimension to students’ education. “Participating in research allows the students to critically think about the information they learn in classes or books and also to question the factual nature of information. They experience how much work goes into obtaining a single significant or non-significant finding, and how the smallest variable may change the outcomes of a study,” she said. “My students were very organized and passionate about our project. They asked questions and offered ideas that were extremely helpful for the project. With their help, we should be able to complete the project and publish it,” she said. “We were very productive and were able to get a lot of work done in a relatively short period of time. It was very satisfying to be part of such a great initiative to promote research at the undergraduate level,” Connolly said. Dr. Hannah Bennett, Professor of Kinesiology, said that working with kinesiology students Ashley Franqui, Michaela Soler and Alexis Whitehead on “The Effects of Physical Activity on the Psychological Well-Being of College Students who Identify as LGBTQ” was as rewarding for her as it was for them. “In our department, students are generally exposed to numbers and quantitative data where they can determine that there is or is not a relationship from set variables. I am more of a qualitative researcher and was able to introduce them to a new side of the research world through interviews, coding and a very different type of analysis. It is a stark contrast to what they have known as research, as a whole, and they took it on with open minds,” Bennett said. Dr. Amos Meyers (from left) lead undergraduate kinesiology students Michelle Altvater, Nicole Koellner and Dylan Rose in investigating Unilateral and Bilateral Training Effects on Bilaterial Back Squat Strength. “As our student body grows and expands, giving excellent students the opportunity to contribute to research will only benefit the university in showcasing the talent we produce and encouraging future students to be involved,” he said.